3D Architecture Animation Creator is a plugin that will help designers to quickly create animations, specially for architecture growing animations. By using it, we can fast create position, rotation, scale, as well as visibility animations for several objects. · Generate position, rotaion,scale and visiblity animation. · Along the x, y, z direction generated animation. · Along the path generate animation. · Generated by random order. · Objects along the x,y,z direction or randomly generate position,totation,scale animation. · Objects along World or Local Coordinate System generate position,totation,scale animation. · Can point out start frame of animation,length of frames for every segment of the animation,length of internal frames between animation segments. · Internal and segment of animation genarated randomly. · 3D Architecture Animation Creator can calculate position of the end frame. · Set the moving distance,rotating angle and percentage of scale. · Any combination of position,rotation,scale and visibility can create complex effect. 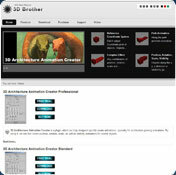 You cannot download any crack or serial number for 3D Architecture Animation Creator on this page. Every software that you are able to download on our site is legal. There is no crack, serial number, hack or activation key for 3D Architecture Animation Creator present here. Our collection also doesn't contain any keygens, because keygen programs are being used in illegal ways which we do not support. All software that you can find here is freely downloadable and legal. 3D Architecture Animation Creator installation package is prepared to be downloaded from our fast download servers. It is checked for possible viruses and is proven to be 100% clean and safe. Various leading antiviruses have been used to test 3D Architecture Animation Creator, if it contains any viruses. No infections have been found and downloading 3D Architecture Animation Creator is completelly problem free because of that reason. Our experts on malware detection tested 3D Architecture Animation Creator with various spyware and malware detection programs, including fyxm.net custom malware and spyware detection, and absolutelly no malware or spyware was found in 3D Architecture Animation Creator. All software that you can find on our servers, including 3D Architecture Animation Creator, is either freeware, shareware or open-source, some of the software packages are demo, trial or patch versions and if possible (public domain licence), we also host official full versions of software. Because we want to be one of the fastest download sites on the web, we host all the software including 3D Architecture Animation Creator on our servers. You cannot find here any torrents or download links that would lead you to dangerous sites. Rate 3D Architecture Animation Creator 1.2!